Cybele is the primary goddess associated with transformed priestesses, but there are many similar traditions in the ancient Mediterranean world and beyond. Isis: Gender-variant priestesses, often self-emasculated, danced and performed magic rites with the other women devotées. Such a dance can be viewed on a marble relief at Ariccia, near Rome on the Appian Way. Ecstatic dancing, lifting of skirts, shaking of buttocks, tossing of heads and raising of arms reveal the enthusiasm of the dancers. It also reveals that some are clearly male-born. Such as these were called cinaedi. Hêra: Athenaeus, in his third-century text, Deipnosophistoi, describes the traditional dress of Hera's gender-variant priestesses: "snowy tunics that swept the floor of wide earth", cunningly-wrought arm bracelets, long tresses braided with gold ribbons and crowned with ornate tiaras of gold. They dwelt on the beautiful island of Samos, source of the pottery shards frequently used in the emasculation rituals of Cybele's gallae. Hekátê: Known as semnotatoi or demosioi the "revered ones of the Goddess" told fortunes, practiced magic, and cared for Her sacred places. Physically changed by ritual, they served the patron-goddess of the temenos (sacred threshold), of magic, and of all those who live "on the edge." Ma-Enyo: At Comana, in Asia Minor, this war Goddess was served by a community of thousands of hierodules known as fanatici. Among these were gallae attired in heavy black robes, garland necklaces, and tiaras over dyed-blond braids. They carried double-axe emblems in procession and used a whirling dance to achieve states of ecstasy. The latter fragment of tradition remains today in the dervishes of Konya. The Roman Goddess Bellona became syncretized with Ma-Enyo in late Roman times, though practices changed little. Patriarchists among the Greek population condemned Comana as a city of effeminacy and un-manly luxuries. Demeter: The Eleusinian Mysteries celebrated this ancient agrarian goddess and her daughter Persephone. One part of the mystery rites was the "joking at the bridge", gephryismos, conducted by a galla playing the role of Baubo-Iambe. What did the worshippers see when she lifted her skirts in mockery? Many were drawn to initiation in these rites, including the Emperor Hadrian and his lover, Antinous. Kotys and Sabazius: This Thracian Goddess and her consort parallel Cybele and Attis in numerous ways, particularly in association with music, healing, and variant gender expression. Followers were called baptai owing to their rites of ritual baptism before communion. They would chant in unison, "I have fled the evil, I have found a better way." The term "baptai" among the Romans, came to designate effeminacy and licentiousness for those of homophobic mindset. Asherah: She is the Queen of Heaven, in other languages and ages identified as Ashtoreth, Athirat, Astarte, and Ishtar. Yahweh, the Hebrew God elevated to become the sole deity , was Her consort. Her "male" priestesses were known as kelabim, the faithful "dogs" of the Goddess, who practiced divinatory arts, danced in processions, and served as hierodules, qedeshim, in the company of other priestesses. 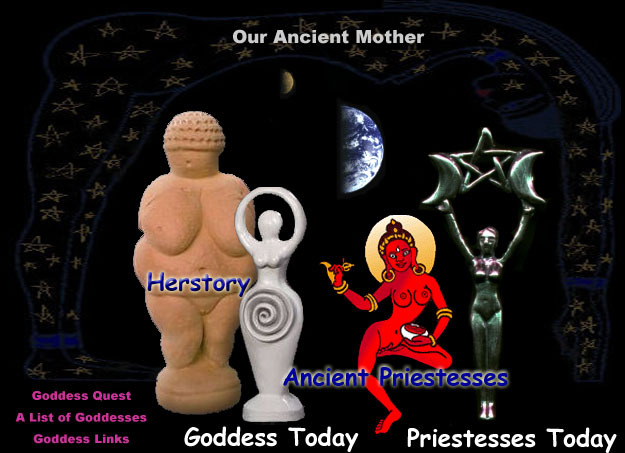 Elements of the goddess worship were largely erased in a cultural purge c. 630 BCE by King Yosiah, at the behest of Yahweh's priests, who required supremacy. Aphrodite: The Cyprian Goddess of love was sometimes depicted in a gender-mixed form, as in the beautiful statue of Hermaphrodite in the Capitoline Museum. Her son/consort was Adonis, celebrated at Aphaca in what is now Lebanon. The annual rites of the Adonia vividly recall those of Attis. Offerings of gold, silver, flowers, and clothing were cast into the Adonis River (Nahr Ibrahim) by priestesses including many who had crossed the boundary between the sexes. A ball of fire was said to appear above the temple as a sign of reunion with the Goddess. Venus Castina became the patroness of Roman males who were born with a woman's soul. Atargatis/ Derketo/ Dea Syria: The Syrian Goddess at Hierapolis had a consort named variously as Hadad or Attah. Attah committed self-castration in repentance for an infidelity. The pair, depicted in the garb of Egyptian women, are also served by gallae and priestesses. Eunus, a follower, led a massive four-year rebellion of slaves in 135 BCE, almost thirty hears after thousands of worshippers of Atargatis were slain at Carnaim. Diana: The cultus of the Roman Diana eventually merged with that of the Hellenic Artemis, goddess of the moon and of the legendary Amazons. She was worshipped in Ephesus as a black meteoric stone fashioned by the Ionians into the many-breasted image of the same Great Mother revered throughout Asia Minor. Even the Christian scriptures jealously echoed "...Great is Diana of the Ephesians" (Acts 19:28). Diana is quintessentially the Goddess of the Antianeirai, female warriors, lovers of the hunt, who refused marriage and the typical feminine roles of the age. Antianeirai, having little regard for men, favored the companionship of women ... and welcomed gallae as sisters. Diana was served by two kinds of priestess: the melissai, "honeybees" , and the remarkable male-to-female megabyzes, the title of Persian origin. The megabyzes, attired in gold-embroidered actaea of Tyrrhian purple, were famed throughout the known world for twin attributes of wisdom and beauty. They carried the image of the Goddess in grand processions on her local festival in late May. These gender-variant priestesses commonly served as makers of magic amulets... telling fortunes through casting of Ephesian "runes". The Great Temple, one of the famed Seven Wonders, met final destruction in the year 405 CE. Constantinople's Hagia Sophia was raised from the profits of this pillage, though many feared that its stones might yet be tainted by the presence of the Ancient Goddess.